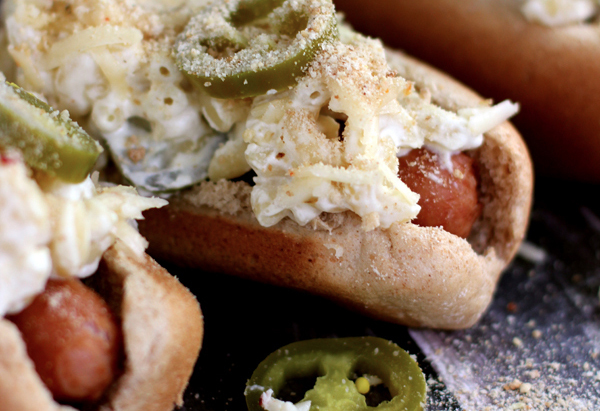 These hot dog makeovers would make Uncle Sam proud. Here we are at another Fourth of July! 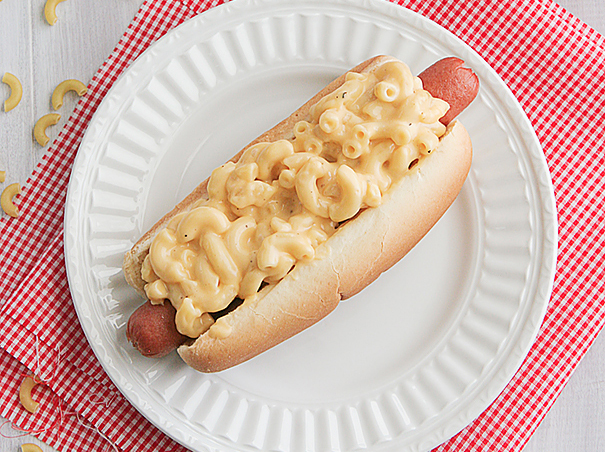 We're ready for fireworks, sparklers, star-spangled everything and that most all-American of foods -- hot dogs! So what if they're not the most, um, homogeneous food? They may be made up of bits and pieces that come from all over, sure, but so is America, you guys. 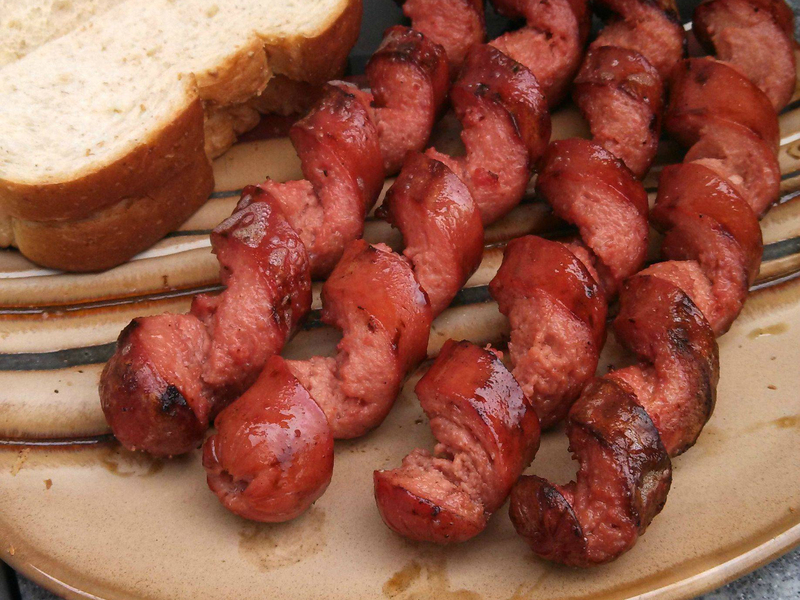 Fourth of July simply isn't the Fourth of July without a nice, hot frankfurter. 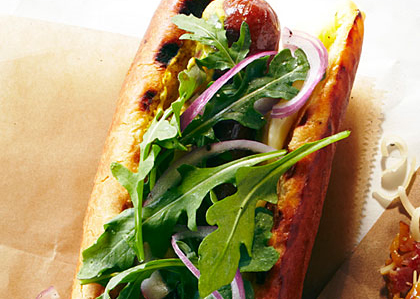 Here are a few tips and recipes to make this year's hot dogs the best hot dogs you've ever had. 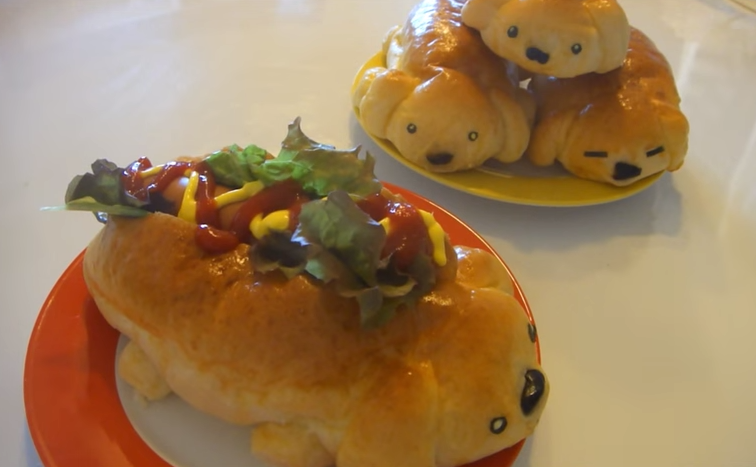 Look at these boring old hot dogs. It doesn't have to be this way! Let's start out simple. 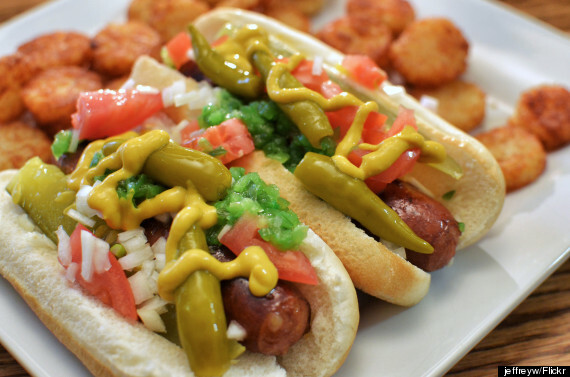 Chicago-style is a deliciously easy way to make a non-boring hot dog. Basically, you throw on some pickles, spicy peppers and a few other things -- including celery salt, which is magic. If you've got eight minutes on your hands, Hannah of My Drunk Kitchen will walk you through it, kind of. Another way to go is just picking a couple tasty ingredients. Like Sriracha. And avocados. Mash that all up together et voilá! A masterpiece. Get the recipe over at Damn Delicious. Or, you know, an entire serving of macaroni and cheese. Yes, please. Don't think about how difficult this would be to eat and head over to Taste and Tell for the recipe. 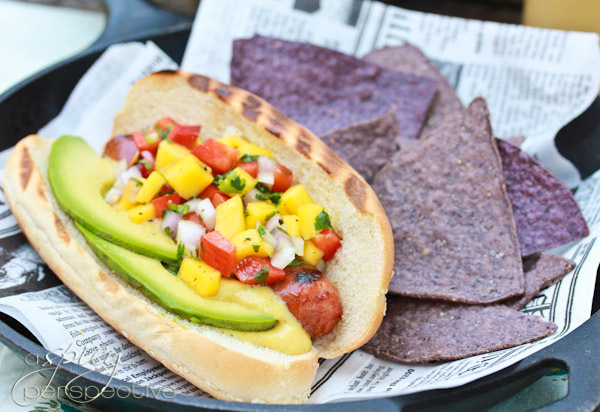 Hot dogs are incredibly versatile. 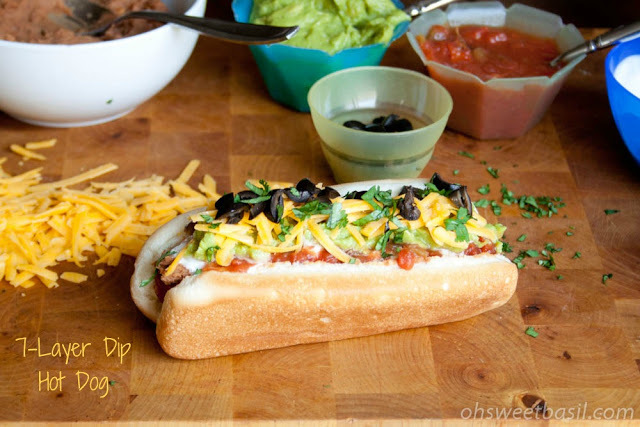 Few things showcase American culinary ingenuity like chip dip on a hot dog. Don't tell us you wouldn't eat that. Recipe available at Oh Sweet Basil. 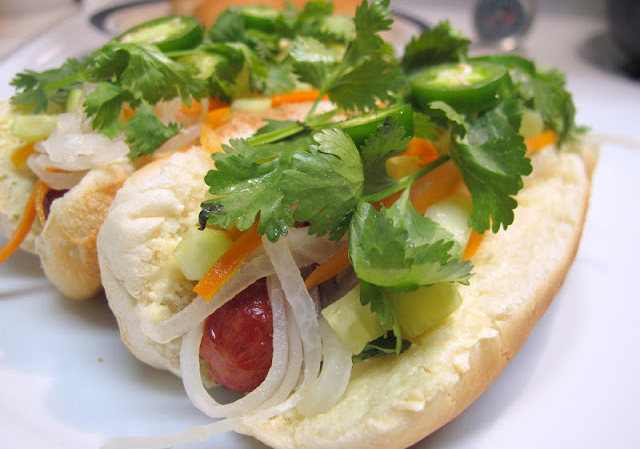 Use them as a vehicle for whatever cuisine you'd like, such as this Vietnamese-inspired bánh mì number. Get the recipe from I Believe I Can Fry, which is our new favorite name for a food blog. If you make up a recipe, you can name it after someone. Here we give you the Tech Billionaire dog. Celebrate the IPO, says Sunset magazine, with Kobe beef and a dash of arrogance. Fine, arugula. 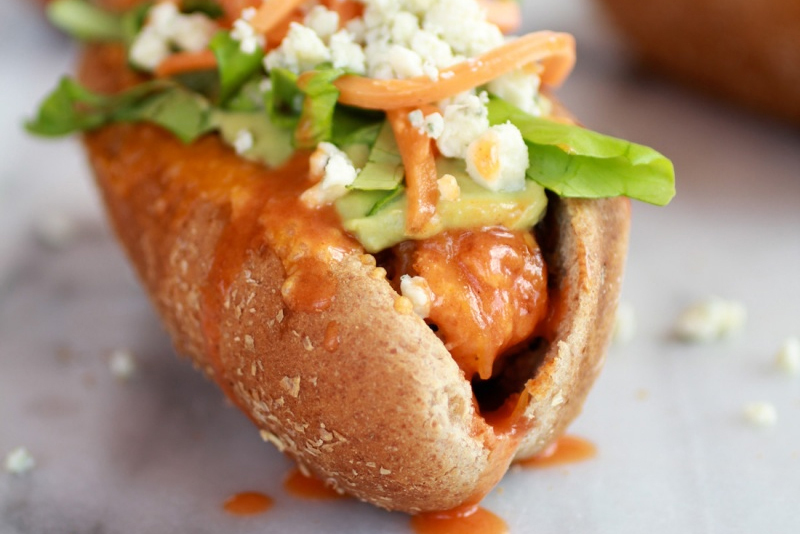 Pro tip: Spiral dogs ensure a much better topping-to-dog ratio in every bite. Also, they look cool. AND they aren't that hard to make. Chow walks you through it in a video tutorial. 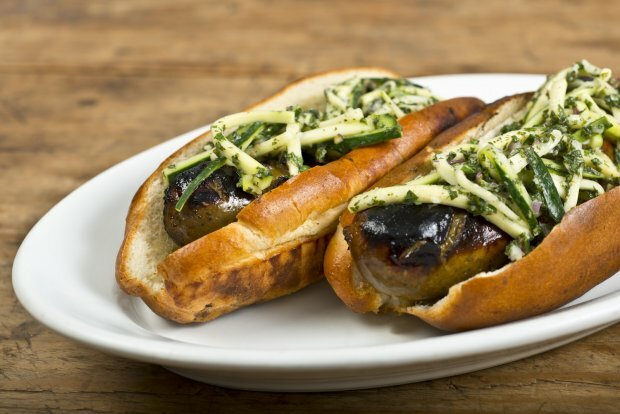 Recreating the world's most expensive hot dog, however, would be exceedingly difficult. But if you really, really wanted to wow your guests and being a tech billionaire isn't impressive enough, a foot-long wagyu beef link drenched in black truffles and topped with truffle butter, organic ketchup, organic sauerkraut, onions caramelized in Dom Perignon, 100-year-old balsamic vinegar, platinum oscietra caviar, some kind of fancy relish and a sprinkle of golf leaf might do the trick. Jalapeño poppers would make an incredible topping, wouldn't they? You'll find the recipe at Melanie Makes. This spicy Middle Eastern sausage is made with lamb or beef and would make a happy substitute for your basic frankfurter. Get the recipe here. Like this delicious buffalo sauce. Recipe at Half Baked Harvest. And some unexpected toppings. Yes, even fruit. Don't knock it 'till you've tried it. 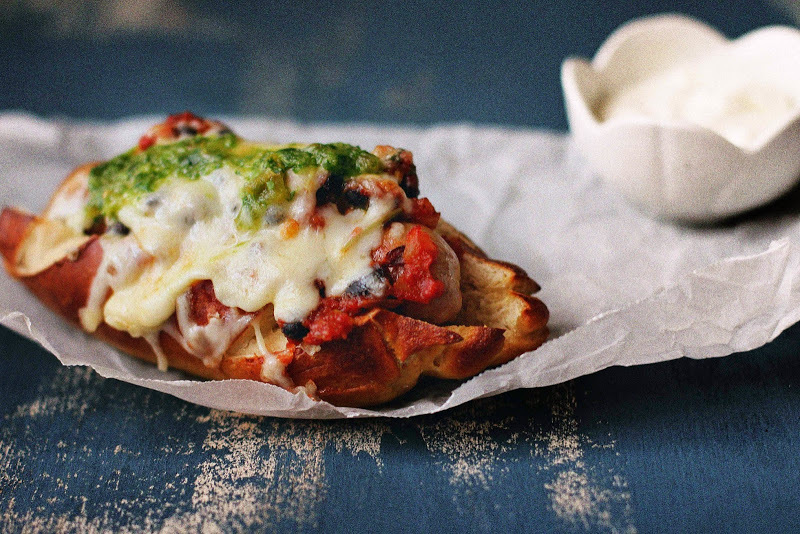 Chili dogs might be pretty standard, sure, but this black bean jalapeño variety is anything but. Put down the canned chili and take a look at Milk and Honey for this recipe. 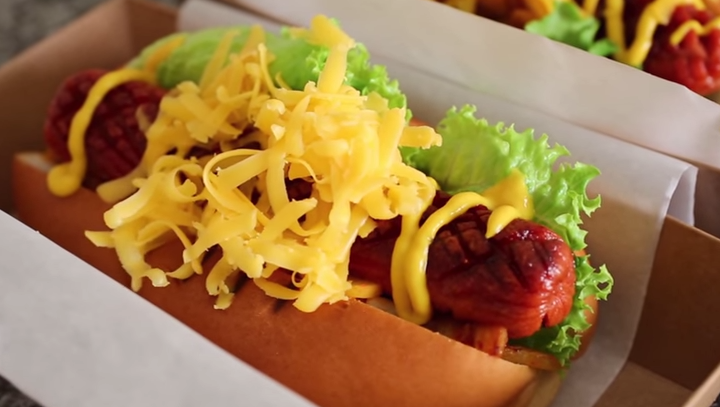 No one told this kimchi dog that hot dogs can't be trendy. Take that, haters. Watch a video tutorial here, and if you're so inclined to make your own kimchi, you'll find instructions here. Then again, the loaded baked potato treatment has never disappointed anyone. You know, bacon, cheddar -- the works. Find the recipe over at How Sweet It Is. 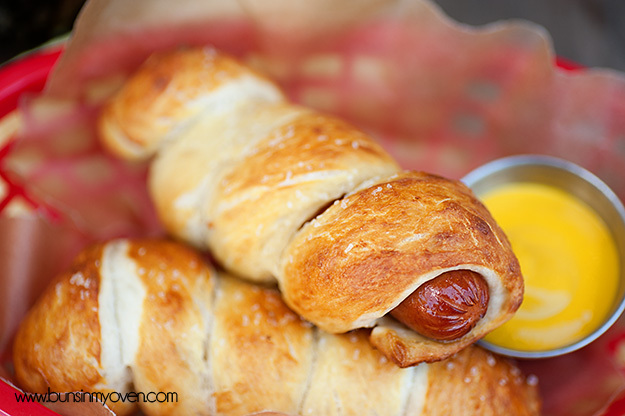 Remember pigs in a blanket? Here's a version for the taxpaying crowd. Adulthood isn't so bad, you guys. Have a pretzel dog. Recipe available on Buns in My Oven. Below the border, Sonoran dogs are big. For a reason. Look at this guy. Look at it. 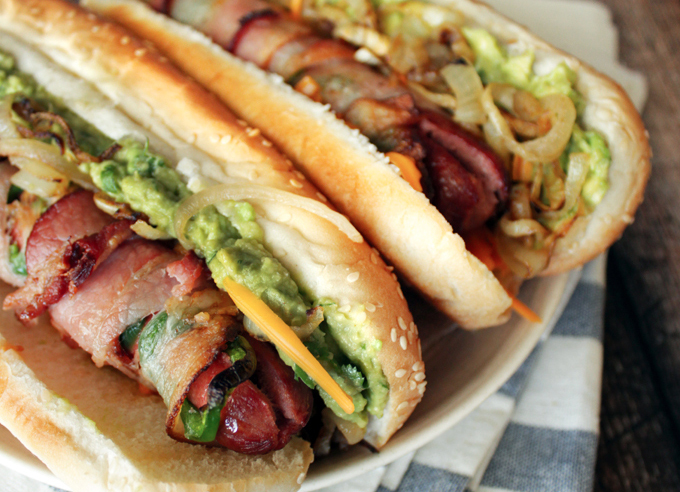 It's wrapped in bacon and doused in jalapeño salsa and we want some right now. Get the recipe over at Port and Fin. 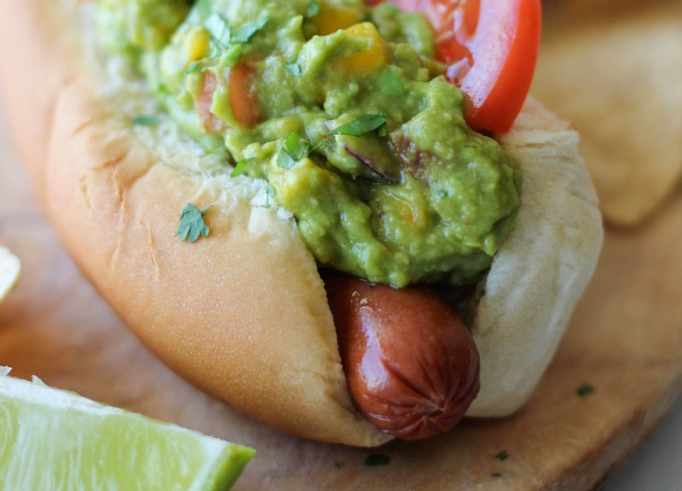 Meanwhile, hot dog taquitos are proof that America is a melting pot, at least, of delicious cuisines. 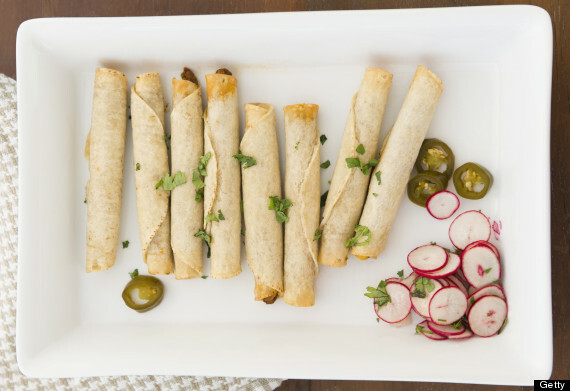 Imagine something like these taquitos above, except stuffed with a hot dog that is itself stuffed with cheese. Head over here for the recipe and photos. "Hot dog or hamburger?" is the eternal barbecue dilemma. Hot dog... 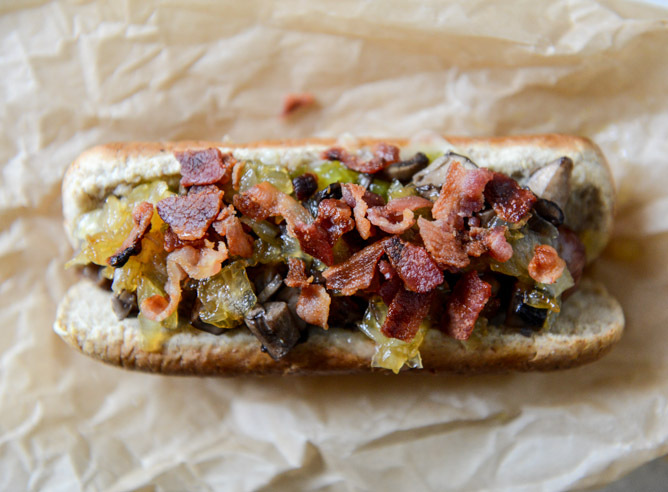 Hamburger... Whatever, here's a hot dog covered in burger and wrapped in bacon. If you're thinking there's a lot of gratuitous bacon happening in this list, we have nothing to say to you because anyone who complains about bacon is living a small, sad, deprived kind of life. Kidding! This variety, however, is as adorable as it is labor-intensive. It's almost too cute to eat. Watch a tutorial here.